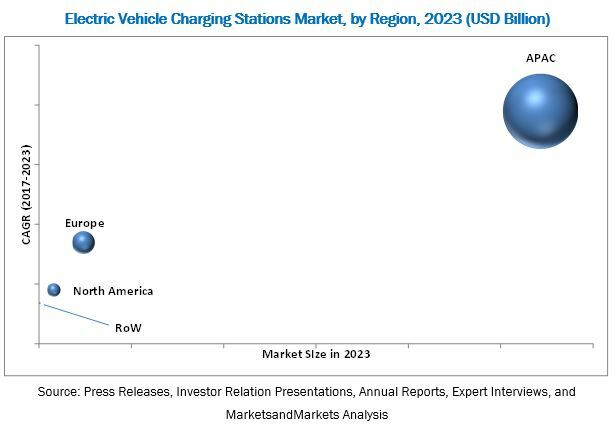 [142 Pages Report] The electric vehicle charging stations market is expected to grow from USD 3.22 Billion in 2017 to reach USD 30.41 Billion by 2023, at a CAGR of 41.8% between 2018 and 2023. The base year considered for the study is 2017, and the forecast period is between 2018 and 2023. There has been a highly favorable ecosystem for a sustainable growth of the electric vehicle charging stations market. Many countries are taking various initiatives to encourage the use of electric vehicle (EVs) to curb the growing concerns related to environmental pollution and global warming. The initiatives are acting as a positive growth driver for the electric vehicle charging stations market. For instance, in November 2016, the US administration announced that it will develop 48 national EV charging networks for highways to cover an overall distance of approx. 25,000 miles across 35 states of the country. This initiative has led 28 states, utilities, EV charging firms, and major EV manufacturing companies, including General Motors, BMW, and Nissan, to work together. Furthermore, in May 2016, the German government launched an attractive incentive program for EV buyers. As per the new scheme, EV buyers will receive a direct discount of USD 4,520. Such incentive schemes and the government’s decision to discontinue fossil fuel vehicles by 2030 are expected to drive the growth of the electric vehicle charging stations market. The objective of the report is to provide a detailed analysis of the electric vehicle charging stations market based on charging station, installation type, and region. The report provides detailed information regarding the major factors influencing the growth of the electric vehicle charging stations market. The report also gives a detailed overview of the electric vehicle charging stations market value chain and analyzes market trends. Furthermore, the report also provides a detailed analysis of the electric vehicle market based on vehicle type and region. This research report categorizes the global electric vehicle market on the basis of vehicle type and region; and the electric vehicle charging stations market on the basis of charging station, installation type, and region. The electric vehicle charging stations market is expected to grow from USD 5.30 Billion in 2018 to USD 30.41 Billion by 2023, at a CAGR of 41.8% between 2018 and 2023. 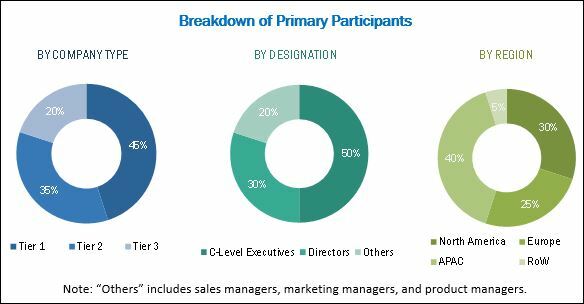 Key factors driving the growth of the electric vehicle charging stations market include government funding, subsidies, and incentives, growing demand for electric vehicles, growing concern toward environmental pollution, and heavy investment from automakers in EVs. DC charging station held a larger share of the electric vehicle charging stations market in 2017. Active participation from EV manufacturers in expanding DC charging network for EV owners is one of the primary factor for high market share of DC charging station. For instance, in September 2016, Tesla opened the world’s largest EV fast charging station in Norway, which can charge up to 28 EVs in about half an hour. Moreover, in October 2017, Tesla confirmed building a 42 supercharging station stalls in Norway, which is expected to become the largest EV fast charging station in the world. Commercial installation accounted for a larger market size of the overall electric vehicle charging stations market in 2017. Commercial charging stations can be installed at taxi stands, retail stores, government offices, and parking lots of work places, hotels, airports, shopping malls, fast food restaurants, and coffee shops. Some public charging stations located at hotels, shopping malls, or coffee shops offer free charging for their own benefits such as increase in sales, corporate branding, and advertising opportunities. However, others may generate revenue through charging fee. The convenience of being able to use an EV charger while shopping or during office hours is expected to boost the adoption of electric vehicles. APAC held the largest share of the electric vehicle charging stations market in 2017. The emphasis from local governments to increase the adoption of EVs and encouraging startup companies to develop new products are some of the main factors driving the demand for electric vehicle charging stations in APAC. For instance, according to Fitch, a leading rating agency, EV subsidies offered in China are the second best in the world after Norway. Another initiative, known as preferential vehicle licensing system, would help EV buyers in China get license plates for free and without a waiting period. Favorable business environmental policies, such as “Made in China 2025,” are also helping startup companies to enter into the EV market in China. For instance, in December 2017, Iconiq, a Chinese EV startup company, announced that the company will start production of its 7-seater SUV electric car—Iconiq 7—in 2019. Another startup, NIO, backed by Tencent, Baidu, and Xiaomi launched its 7-seater EV “ES8” in December 2017. The price of the vehicle is about half of Tesla’s Model X.
ChargePoint (US), ABB (Switzerland), Tesla (US), Engie (France), and AeroVironment (US) are the top electric vehicle charging station manufacturing companies. These players focus on product launches and developments, expansions, and partnerships strategies to enhance their product and service offerings, and expand their business globally.